Compelling acting and prescient storytelling elevate the almost too clever “What if?” premise of A Doll’s House, Part 2. Melbourne Theatre Company serves it while it’s still hot, presenting the first international production of the 2017 Broadway play. The lead role of Nora Helmer won Laurie Metcalf the 2017 Best Actress Tony Award, one of eight for which A Doll’s House, Part 2 was nominated. The role of Nora proves an ideal vehicle to lure Marta Dusseldorp back to the Melbourne stage, and she gives an indelible performance as the fascinatingly flawed, undeniably iconic woman. 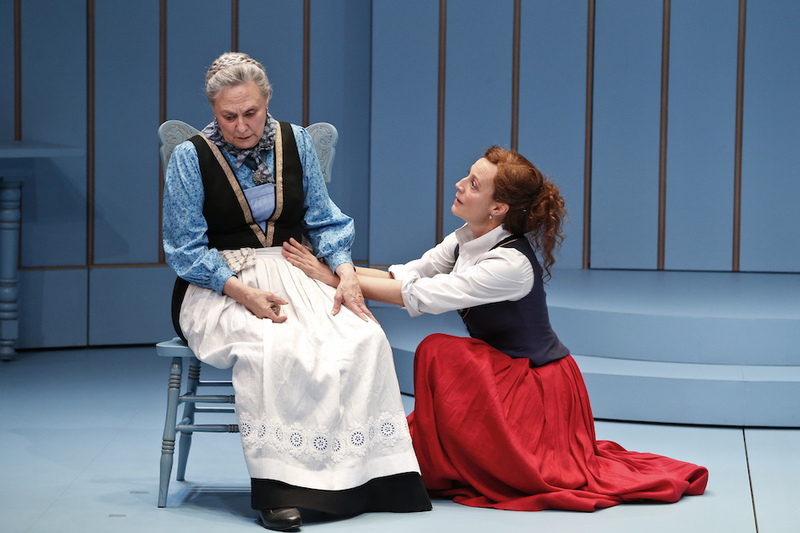 Re-imaginings of classic plays are a popular recent trend (there is even a local version of A Doll’s House, by Lally Katz). 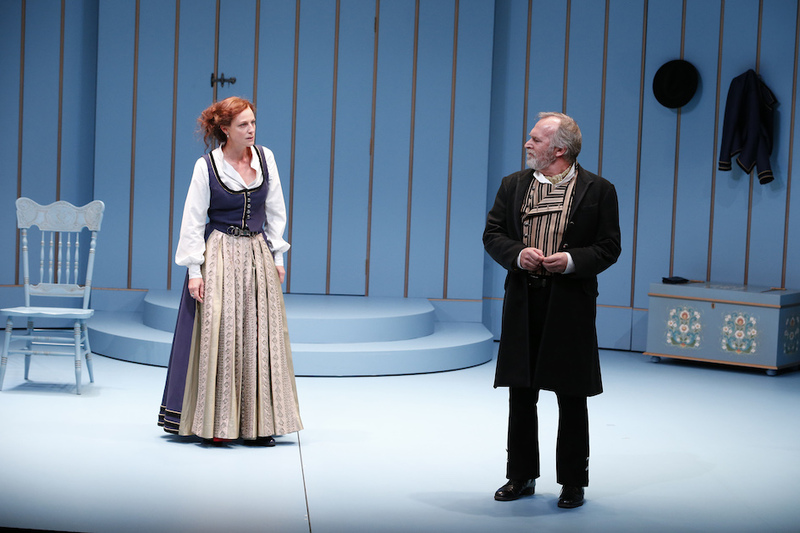 Setting his sights on Ibsen’s classic text, New York playwright Lucas Hnath eventually decided not to rewrite the much-studied play but to explore Nora’s life beyond the final moment of A Doll’s House when she walks out on husband Torvald and three children, closing the door behind her. 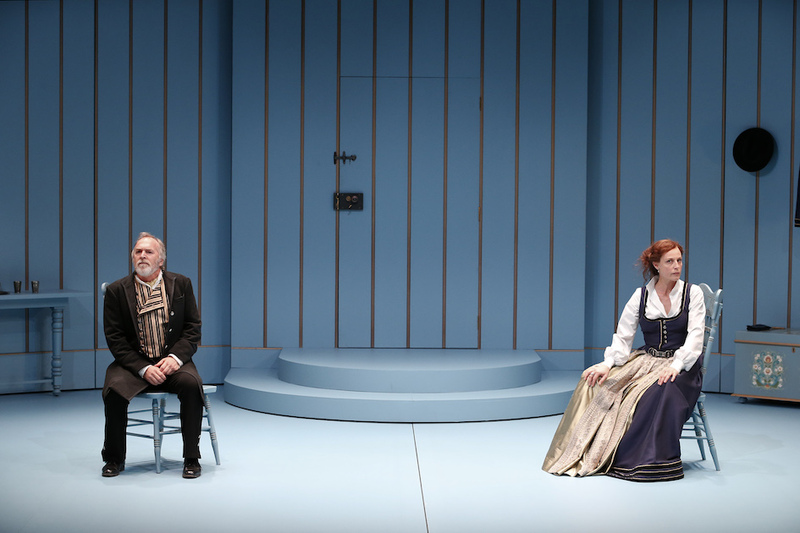 As the audience enters the theatre, designer Tracy Grant Lord has placed that same door initially downstage centre, in a simple setting of powder blue ribbed walls. The entry of the audience is projected on screens above the stage, not too subtly suggesting that we are going to see ourselves in the play ahead. Nora’s arrival is shown on screen, before she leans in and peers down at the stage, her enlarged face giving the room the striking appearance of a doll’s house. That Nora left her husband and family was shocking in 1879. Fifteen years later, she continues to suffer at the hands of men, a victim of the lack of power and rights of women in a society ruled by men. Nora’s reclamation of power, or her attempt to do so, makes her a modern heroine, yet Hnath does not go for simple solutions or rosy resolutions. To facilitate resonance with current audiences, the text is written in contemporary language, swear words and all. As a natural extension of this, director Sarah Goodes has the cast speak in neutral, natural dialects. With little in the way of furniture or props (all of Nora’s possession were given away or thrown out) this really is an actor’s play, with extended speeches that approach the effect of operatic arias. Now a novelist, Nora is not only writing stories but writing her own story, and yet the interactions with her long abandoned husband, daughter and nanny are beyond her control. The views on marriage espoused by Nora and, to a lesser degree, Torvald are designed, of course, to prompt audience reflection and, later, discussion. We can feel somewhat superior, or, perhaps, grateful, that we enjoy many of the freedoms that Nora wishes to see in her lifetime. Meanwhile, for many, the struggle continues apace. Goodes draws in the audience with the play’s gentle humour, guiding the four actors to craft layered characterisations that pack a hefty emotional punch. 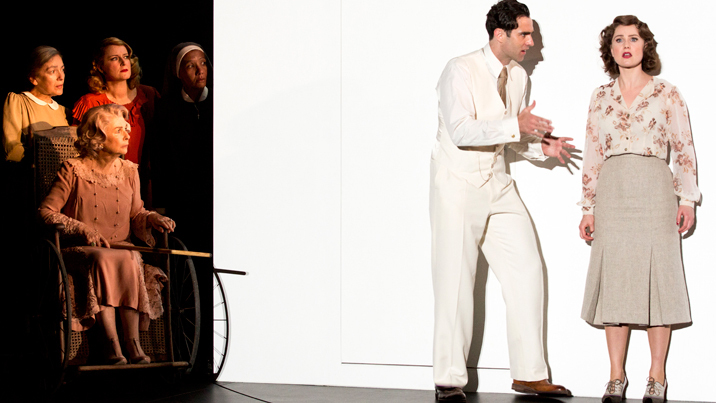 The waves of energy and intensity in the play’s various confrontations are expertly judged. 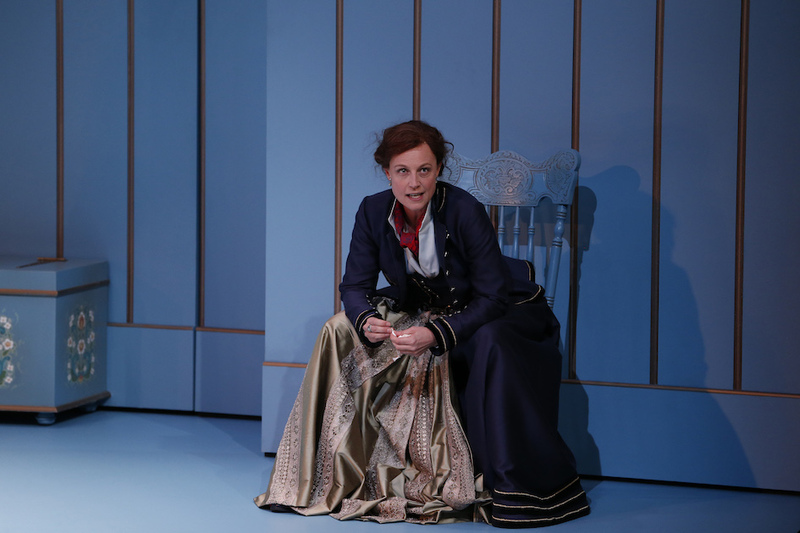 A Doll’s House is not performed all that often locally, yet those who are unfamiliar with the original play and its characters will have little difficulty picking up the threads and also becoming involved with characters in their current incarnation. Trading her usual luminous blonde beauty for thick henna locks, Dusseldorp projects an earthy attractiveness that is rooted in her character’s burgeoning sense of power and self worth. The play may be only 90 minutes in duration, but Dusseldorp’s performance has a sense of the epic; her ability to command the stage while still supporting, enhancing and enjoying her fellow actors is a true gift. Conveying Torvald’s sense that it is he who has been wronged, Greg Stone keeps the audience on edge in regard to the man’s true intentions. Appearing somewhat older that Nora gives Torvald a vague air of vulnerability, and when the character arrives home having been beaten up there is a further edge of sympathy in the air. Stone deftly balances these aspects in a neatly underplayed performance. 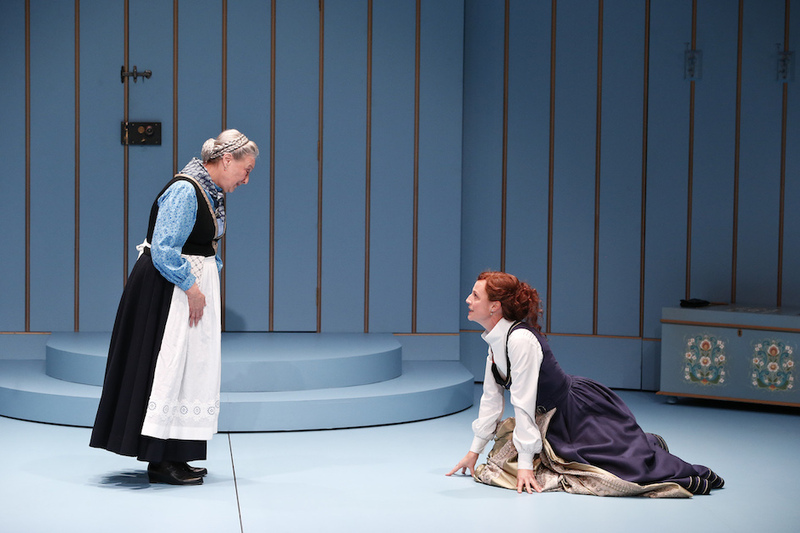 Melbourne Theatre Company stalwart Deirdre Rubenstein has a gem of a role in the craftily good natured nanny Anne Marie, who appears all smiles yet delivers many a subtle dig. Largely responsible for setting the tone with humour at the top of the play, Rubenstein gives an endearing, entertaining performance. 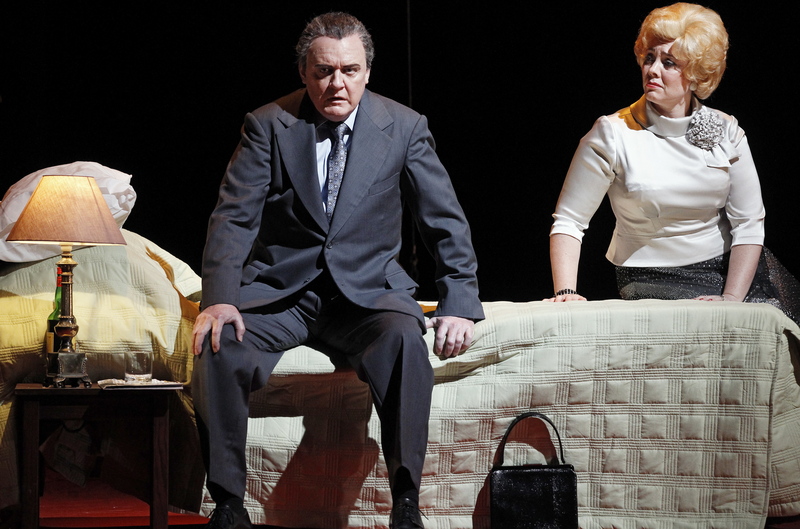 In her Melbourne Theatre Company debut, Zoe Terakes more than holds her own alongside far more experienced colleagues. Given that the character had no dialogue in A Doll’s House, Nora’s daughter Emmy is almost exclusively Hnath’s creation. Cherubic in appearance, Terakes has well developed emotional intelligence that allows her to volley with Dusseldorp’s Nora on a very solid footing. The central extended mother and daughter scene is scintillating in its frisson, and has the audience utterly entranced. 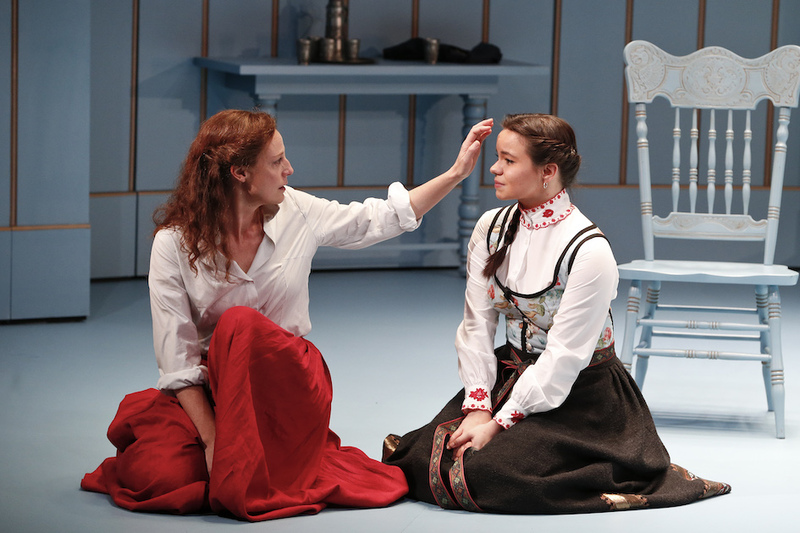 A well-judged piece of theatre, A Doll’s House, Part 2 is as enjoyable as it is thought provoking. A Doll’s House, Part 2 plays at The Sumner, Southbank Theatre, Melbourne until 15 September 2018. The A Doll’s House, Part 2 program can be read online. I’m really disappointed that you didn’t review Gloria, which was a knockout! I can only assume you didn’t think much of it. That’s a pity. The MTC didn’t really do a lot to promote Gloria (via Instagram and Twitter) I can’t think why, it was a credit to them and we’ll reviewd overall. They were too busy gushing over An Ideal Husband – a nice, safe easy play with a built in audience. I was counting on critics like you to balance things out. Oh well . . . Life wasn’t meant to be fair! Thanks for your comments, Justine. I loved Gloria! I was blown away by it, especially having gone in knowing nothing about the story. There is actually a really good reason why I didn’t review Gloria – I was invited to do so by MTC. 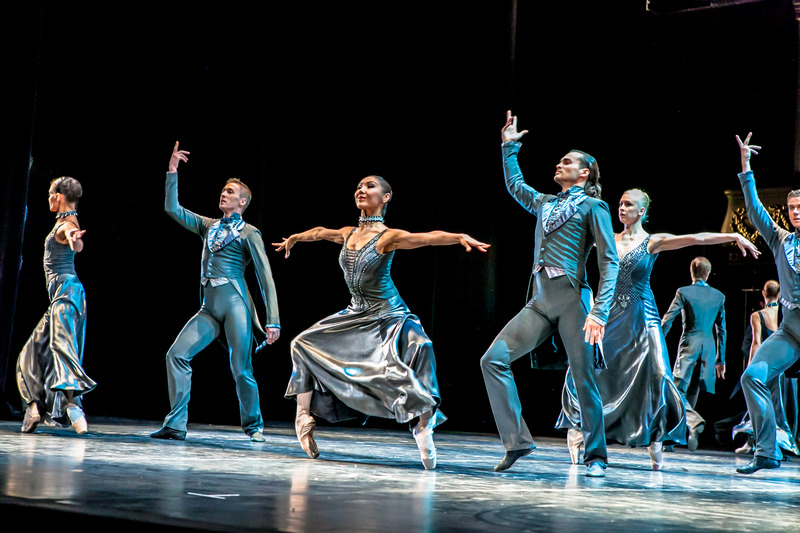 I have traditionally focused on musicals, operas and ballets. I saw Gloria at one of the very last performances when a friend took me along. I went to the opening off An Ideal Husband with another friend and decided to review it. I then contacted MTC about continuing to attend and reviewing their plays and they agreed. So look out for my MTC reviews from here onwards. Furthermore, why does McCune’s work never get a mention unless she’s in a musical, not to mention all the other fabulous – and relatively new actors starring in plays at the MTC and STC, including Gloria. I don’t think I’ll bother with sites such as this any more. I see amazing performances and look gorward to seeing them recognised, and yet the same handful of actresses (and actors) like Dusselldorp, get fawned over relentlessly and it becomes dull. The fact that this review featured Marta Dusseldorp was really just a coincidence related to the fact that I have just started reviewing MTC productions. I am very big on promoting up and coming actors – for example, see my comments about Zoe Terakes in this review. Keep reading, and I hope you will see more material you like in the future. I apologise for the odd typo, I’m sure other commenters will be smart enough to work them out.